This paper describes a theory where the Mandelbrot Set acts as a template, or generating object for the universe, and helps to define the general character of the forces of nature. Although I hope to develop some of the concepts more rigorously in future papers, the document you are reading is meant to be mainly a non-technical overview, or summary, of my Mandelbrot Cosmology theory. This theory deals handily with the subject of symmetry-breaking and describes how cosmological evolution parallels the evolution of form around the periphery of the Mandelbrot Set, and the family of other figures derived by analyzing the process of its creation. It attempts to answer several questions that are still mysteries of Modern Cosmology, including the problems of missing mass and accelerating expansion, and it holds out the promise for further answers. It also explains why (according to recent astronomical measurements) the large-scale distribution of matter in space appears to be a fractal, and has a Hausdorff dimension of almost precisely 2. The Mandelbrot Set has been shown to have a Hausdorff dimension of exactly 2, but is this just a coincidence? Perhaps not. Any demonstrable analogy of the M-set to the process of cosmological evolution could prove immensely valuable, as the Mandelbrot Set can be explored in exceedingly great detail. By this point in time, it can also be explored using relatively inexpensive computers, available to almost anyone. In my original conception of this subject, I had a fair grasp of the Standard Model of Cosmology, or Big Bang theory. What I did not posess was a full understanding of Inflationary Universe cosmologies, and why they avoided many of the complications that arise when when the Standard Model of Cosmology and the Standard Model of Particle Phyics are applied together. Simply stated, the predictions and observations do not quite match, and a number of adjusting factors have therefore been introduced by scientists to make things work out (fundamental constants and re-normalization). I now know that there is a lot more to the story than the conventional picture will admit (even after all those adjustments), and that I may have found the answer to explaining (more accurately) how the universe evolved, before I understood why it is so. Since that time, I have filled in some of the gaps in my understanding, while exploring the importance to cosmology of the nature and evolution of space itself. Now it is apparent to me that a Cosmology derived from the Mandelbrot Set is by nature an Inflationary Universe theory which shows how 3-dimensionality and the 2-dimensional universe are holographically related. It describes how 2-d spaces become 3-d, and how space becomes curved, which inititates Symmetry Breaking in the early universe. Little by little, I will be revising this paper to explicitly reflect this view. Regular plane geometry sets theoretical limits on the simplest objects which have a uniquely defined form. Fractal geometry has discovered the opposite extreme, the most complex objects which can be uniquely defined for a given number of dimensions. Some theoretical physicists (Maldacena, Bekenstein, Witten, and others) propose a model of reality (holographic theory) that suggests we live in a 2-dimensional world which only appears 3-dimensional, and this concept seems to support the idea that the overall form of our universe is a fractal. In my view, fractals are a means of data compression nature employs when the amount of information to encode exceeds the representational capacity of a system, allowing a 2-d form to rise toward the next higher dimension (and so on), in order to encompass more detail than simpler geometric forms will allow. In this theory I refer to a figure, or object, known as the Mandelbrot Set (named after its discoverer, Benoit Mandelbrot), which has been called the most complex object known to Mathematics. It is the grandaddy of complex forms, as the bounding edges seem to spawn every kind of pattern imaginable, and all of these forms are connected. If one magnifies a detailed section, more detail is seen, without any limit. Further magnifications of the most complex parts of any given area of the set will reveal more, and more, complexity. The shore of the Mandelbrot Set is at least as complex as the shoreline of any body of water, or other natural boundary. In addition, there is a kind of complexity not easily described, and having few analogies in earthly form. The area which is at the shore of the Mandelbrot Set is dotted with miniature replicas of the entire set. Each of these replica sets is connected to the main body of the Set, by an infinitesmal thread. If the thread is magnified, it is not continuous, but rather it is seen to consist of a chain of miniature replica sets, connected to each other by an even finer thread. The replicas duplicate all of the detail of complexity found in the main set at the boundaries, but they are distorted copies, as if they were a shadow of the main body, held at an angle to the light. We do see some examples of this in nature (though not many). If one examines a Spleenwort Fern or a head of Romanesco Broccoli, there is a clear representation of this quality of self-similarity, as any frond resembles the entire fern, and any bud resembles the entire head of broccoli. 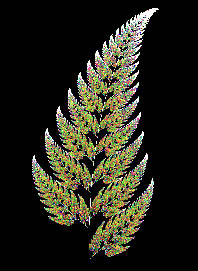 And a Fractal Fern is very easy to create mathematically, using iterated function systems, with only a handful of numbers. 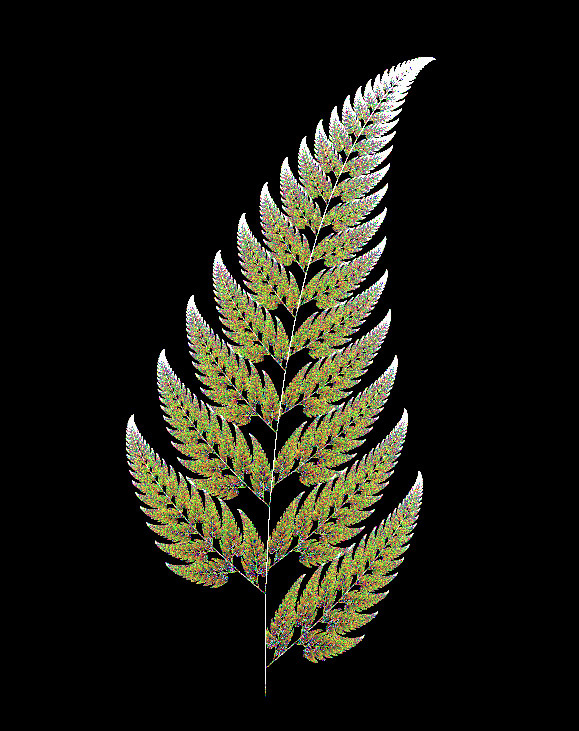 This has prompted some to ask if perhaps the mathematical fractal is the 'mold' or 'template' for these ferns. The question this paper raises is whether the Mandelbrot Set is serving a similar function in the Cosmology of the entire universe. When I first encountered the Mandelbrot Set, I was taken by the intense beauty of the object in an abstract artistic sense. As I became an explorer myself, and I got a grasp of the overall form of the object, I was drawn to examine the way in which forms around the edges seem to go through a progression from the cusp near the origin, to the tip on the opposite end. I also wanted to simply zoom in more deeply, so I could immerse myself in its beauty. As my computing power was limited, and my desire to see detail was great, I spent a certain amount of time looking for ways to alter the fundamental algorithm to serve as a shortcut. It was my desire to find a test for convergence that didn't require one to wait until the iteration limit, to determine that a given point was within the M-Set. I was visiting a friend (Mark Little) who is a programmer, and I asked him how one such approach might be implemented. When he put this change into the code for the program, the result startled me. It was not what I expected, but perhaps it was something even better. It was the outline of the Fractal Butterfly figure depicted on the opening page, and below. My first thought was "Oh my! It's the Big Bang." The enlarged annotated image (clickable from image below) shows this correspondence in a glance. This was the beginning of my search for meaningful insights into Cosmology, through exploring the wonderful realm of form found near the Mandelbrot Set and its family of associated figures. What I found might never have occured to me, or it might not have been so profoundly apparent, without that lucky 'accident,' however. I eventually did find a shortcut, but the Fractal Butterfly figure is what led me to explore the cosmological implications of the Mandelbrot Set. The process, at first, consisted of drawing analogies with standard Big Bang Cosmology, and with other cosmological theories popular at the time, but Observational Cosmology has brought some surprises over the last ten years, and high-energy Particle Physics has found some interesting evidence for a reality beyond the Standard Model, so I later came to find out that studying the Mandelbrot Set reveals aspects of the universe that the Big Bang theory does not, and consistently offers insights into the nature of reality that other theories of Physics and Cosmology do not offer. But even after all these years; I am still wondering why there is a correspondence at all, and to what extent the observed parallels hold out under close inspection. The fact that this theory still seems to hold out the promise of meaningful answers is the primary reason I have decided to re-visit this idea, and to elaborate upon it, after all this time. The formulation of the Mandelbrot Set relates to a repeated mathematical function acting upon the set of complex numbers. If we take a complex number (part real, part imaginary), multiply this number by itself, and then add the result to the original number, this defines a cycle of action. Each complete cycle of computation and comparison is called one iteration. If one repeats this process for each successive result, the value of the function will grow progressively larger for some complex numbers, for other numbers it grows smaller, and for others it will approach a constant. Each complex number is a point on the complex plane whose coordinates are a pair of numbers, one is real, and the other imaginary. Those points on the complex plane for which the function converges (where the final result doesn't approach infinity) are said to belong to the M-Set. Those points that don't converge are outside it. This process defines the outline, boundary, and shape of the Mandelbrot Set. The iterative function defining this process is z = z2 + c, or more properly, zn = (zn-1)2 + z0. One can use other exponents (z3, z4, etc. ), or substitute other polynomials (e.g. - z = z3 - 2z2 + z), and define a meaningful form which is a Mandelbrot Set for that function. However the first, and foremost, of these figures is by far the most detailed, and/or complex, member of this family. What I mean to say is that substituting a more complex generating equation (by using higher-order polynomials) actually results in a form that is far less detailed! It is notable that a function involving a simple squaring operation (plus addition) creates, or defines, the object with the most detail of any form known to Mathematics. The study of this form leads me to draw numerous analogies between it and the Cosmology, or process and structure, of our universe. In fact, I believe the two are isomorphic, which means there is a one-to-one mapping between the two forms. The implication is that the Mandelbrot Set allows us to study the processes by which the universe evolved, by examining the progression of forms along its boundary. As one travels outward from the origin or zero-point (0, 0i), the closest defined point on the border (0.25, 0i), is called the cusp, and this is where I believe the saga of creation started. This very special spot corresponds to the first moment of the big-bang, when all of the universe appears to occupy an infinitesmal extent in space - as close as we can get to a single point (called the Planck length). As one continues outward, from the origin, along either edge of the Set, the character of form at the boundary goes through a definite progression of natures. One form, aspect, or pattern, after another, becomes predominant, and there is a smooth transition to the next phase or aspect. There are different stages to this progression, which arise and then mutate as one follows the edge from the cusp around the rim of the cardioid, and around the large circle toward the tip. This suggests a process, or a sequence - an evolution of the various qualities of form. Though the entire Mandelbrot Set exists at once, it is as though a creative process unfolds when you follow the curve outward, and trace it to its opposite end. The key point here is that this sequence of unfolding forms follows a progression which largely parallels the order of events described by modern cosmological theory. Specifically, the different cosmological eras, as set forth in conventional Astrophysics, map onto the form of the Mandelbrot Set in a distinct way. This correspondence, or mapping, is very straightforward. As one travels from the cusp, along either edge, to the point, or spike, at the extreme extent (-2, 0i), the changing character of form mirrors the unfoldment of the universe over time! That is; we can trace out an evolution in the Mandelbrot Set that largely parallels what we know of the progresssion of past cosmological eras, and is reasonably consistent with what modern Science imagines the future of the universe will be. This raises the question of why that that might be true. I posit that the existence of this primal form (the Mandelbrot Set), as an object outside of time, or in terms of its mathematical possibility or inevitability, had a profound effect on the possibility space of the primeval universe, and still serves to shape its evolution today. It is notable that the Mandelbrot function (z = z2 + c), and Einstein's famous relativity equation (E = mc2) both involve a squaring operation on that variable which denotes motion, or change. In viewing the unadorned shape of the Mandelbrot Set, the resemblance it has to cosmological unfoldment is fairly subtle, and rather subjective, especially when viewing the Set as a whole (zoomed-out). It is possible, however, to highlight trends within the iterative process by which the Mandelbrot Set is derived, and thus to see the underlying patterns of its emergence clearly. 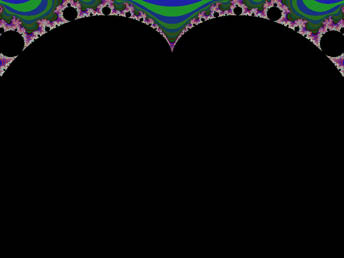 The most common practice when making Mandelbrot pictures is to depict areas which almost converge (called the repeller sets) in brilliant color. The color indicates how many times the function is iterated (repeated) before a particular point exceeds the boundary condition. But there are other interesting behaviors to illuminate, and so we can color-in those areas, as well. Areas can be highlighted that show specific behaviors of the function which take place between the beginning of calculations for a particular point, and the eventual convergence or expansion of the function. This has been one of my areas of intense investigation. The Fractal Butterfly figure is one way to display the character of this (otherwise unseen) evolution of the function, but is certainly not the only application of this principle. The range of values which satisfy the Mandelbrot equation (z = z2 + c) after repeated iterations is actually fairly small. No values with a size greater than two converge. All positive real numbers greater than 0.25 will go to infinity rather quickly, but smaller numbers will converge. The point (-2, 0i) is likewise right on the edge of the set, and it is a repeating point. If multiplied by itself, (-2, 0i), or merely -2, becomes (4, 0i), or 4. If this is added to -2, one obtains a value of 2, and if the process is repeated, the value of 2, or (2, 0i), comes up again, and again, in a cycle which repeats the same value every time. The successive iterations for some points in the Set may trace out a swirling star spiral, or some other interesting figure, but will eventually settle on a particular value. Some coordinates correspond to a value that repeats every other time, or every third time. If one were to catalog the location of all repeating points within the Mandelbrot Set, and classify them by how soon they repeat, one would find that an interesting pattern exists. Different portions of the Set have a distinct period or frequency of repetition. For points within the cardioid shaped area of the main body, the function will eventually repeat (to any particular degree of accuracy) the exact value of the last result. For points in the largest circular area, the value which repeats is that of the previous (the second to the last) result. The smaller circular areas (blips around the edge of the cardioid or large circle) are points whose size value is repeating with a longer cycle of repetition. Note that the majority of these points will enter the repeating phase only after many iterations have ensued. More iterations are always required, in particular, as one approaches the edge of the set, while points near the center of the cardioid or largest circle resolve fairly quickly. The period of repetition for all points within a given circular bulb are consistent, however, which means that it is the 3rd from the last or the 5th from the last value (and so on) that is repeated, once the function does repeat. All of the points which display this repeating behavior are also points in the Mandelbrot Set itself - points for which the generating function converges. Instead of plotting the repeating points, one can display those points whose value is either increasing, or decreasing, over a particular number of iterations of the (z = z2 + c) function. Both the variety, and the character of these resulting figures are striking in their representation of the various aspects of a theory of process, and the unfolding of any evolutive process such as a Cosmology. Not all of these figures produce form with endless detail, however. Perhaps the most significant example among the associated figures I have found is that produced by displaying those points for which the size (of the dynamical variable) decreases (or approaches zero) over three iterations of the Mandelbrot generating function. This figure (shown on the opening page and below) depicts what appear to be butterfly wings in the main, cardioid shaped, region, and all manner of small disks around the periphery to the opposite end. Upon closer examination, one can see that most of the colored disks have plumes, as well. This is the powerful image which inspired me to elucidate this theory, in the first place. I believe that these butterfly wings represent matter-energy exchange reactions which were continual occurrences during the time shortly after the big bang, and before the decoupling of matter and energy took place. The disk shaped areas represent the various possible varieties of sub-atomic particles, and atoms. A sense of various types of interactions is also conveyed along, or within, various parts of the periphery. The character of the observed forms, in certain areas, is highly suggestive, and also progresses through a variety of prominent forms as one travels from the cusp to the tip, or extremity of the Set's extent. That these forms are reminiscent of cosmological events, or seem to represent the natural forces and cosmological eras to some degree, is greatly significant, in my opinion, and I believe this connection should be explored. That is the reason for my writing this paper, and revising it at this time. It is becoming apparent that the connections I first intuited almost twenty years ago have far more significance than I could grasp as a younger man, and far more to offer than I could imagine at that time. To explore this wondrous imagery with an open mind makes one wonder if perhaps the Mandelbrot Set, with its various families of related objects, is a model for the character of form in our universe, for the evolution of form, or is in some way a boundary of the form molding process. After hours of exploration, one still wonders if it is possible to see enough of the detail which is present. It is awesome, and mind-boggling, beyond the wildest dreams of the average human's imagination in terms of its scale and variety of detail. One can be focused in on detail of a highly magnified area, and then decrease the magnification in steps in order to see what forms these details are a part of. You find yourself zooming out on a sea of form, and that wondrous jewel you were focused in on, is but a speck on a single bubble in a little clump of foam. And along every coastline, the shape of the foam is a little bit different, but also very much the same. And in each bubble of foam, there is a new ocean of form to be explored. I wish to thank Mark Little and Glenn Knickerbocker, who were there with me in 1986 and '87, when I first began to explore the Mandelbrot Set and all of the delightful things one can do with it. They made sure that I had the tools to do further exploring, and acquired the know-how to use those tools wisely. I also wish to thank Rollo Silver, who published a short article about this theory in his publication Amygdala (issue #7), in November of 1987. In addition, I wish to thank Benoit Mandelbrot, who became excited about the implications of my theory, when he first learned of it. Of course, I should give some credit to the publishers of Scientific American and to A.K. Dewdney, whose article about the Mandelbrot Set (in '86?) positively blew my mind, and got me "hooked on fractals."